Are boardwalk curves standard or can they be custom designed to fit the intended alignment? What is the minimum radius we can design? Does adding a curve to the boardwalk design make a drastic difference in overall boardwalk cost? The designer typically sends us the boardwalk and/or trail alignment. 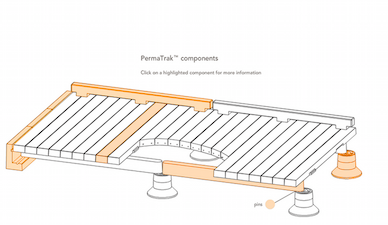 Our engineering team uses in-house automation tools to run through several scenarios and determine the best PermaTrak tread layout for that alignment. We determine a rough cost estimate to produce the boardwalk components for each layout option. 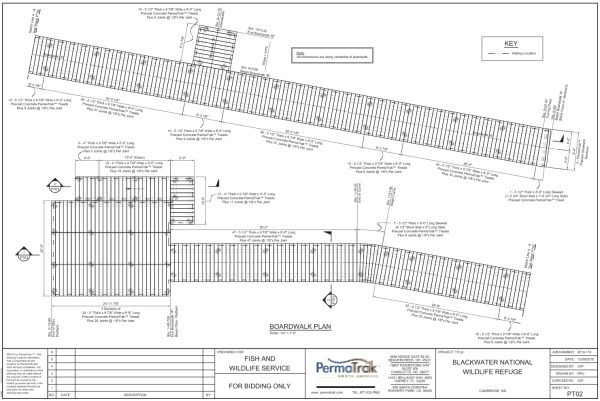 We return a layout drawing or tread overlay drawing showing the most cost-effective layout and an associated boardwalk cost estimate per square foot. Once the alignment is accepted, we then begin to evaluate the pier locations and thus establish the beam span lengths (stringers). This is all-important in the cost evaluation process to ensure the owner receives the most economical concrete boardwalk layout. In most cases, we are very close (within inches) to a desired alignment. We can cost-effectively produce skewed components that provide designers a lot of design flexibility. 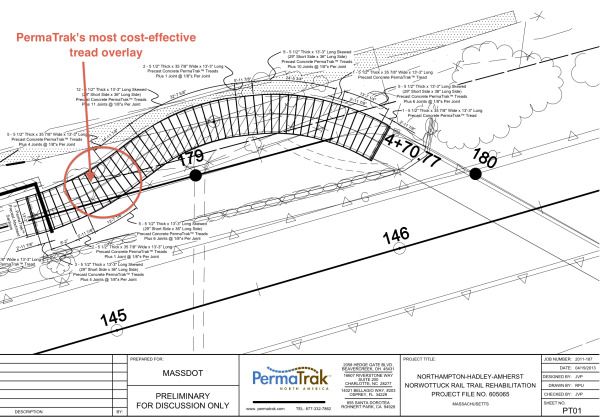 An example of this tread overlay is shown below for the Norwottuck Rail Trail project, a Massachusetts DOT boardwalk application in Hadley, MA. Typically with multi use trails or elevated greenways, a curve is relatively gradual so as to allow runners and cyclists to keep their momentum and avoid collisions. With simple curves and gradual turns, our material price should not drastically change, and we’ll work with you to provide a cost-effective boardwalk system. We have not come across a layout yet that we have not been able to do, but some will be more expensive to produce and install. The extreme example of this would be a boardwalk that is non-linear, full of switchbacks, with pear-shaped observation platforms. 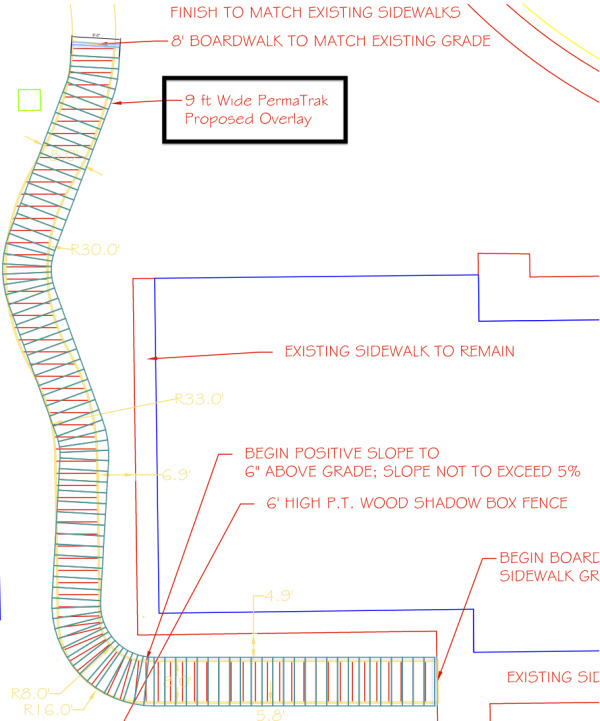 If you send an email to Jason Philbin with the boardwalk alignment, we would be glad to follow the steps listed above and produce a tread layout. 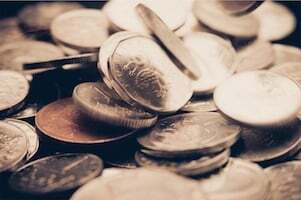 We hope this article helps as you evaluate materials and present preliminary pricing to your client. Cost Estimates - How Much Does a Boardwalk Cost?